For 18 years Ozomatli has made quite an impact on the world, gaining much notoriety for their outspoken and passionate political views. Starting from the Peace and Justice Center in Los Angeles, where they began jamming together, the band was quickly recognized and in 2007 they were invited by the U.S. State Department to serve as official Cultural Ambassadors on a series of government-sponsored international tours to Asia, Africa, South America, and the Middle East. Additionally, in 2010 the City of Los Angeles officially made April 23rd “Ozomatli Day,” based upon the band’s efforts for and in support of the city. Throughout their career, Ozomatli has primarily been blasting out hits for adults and has accumulated quite a fan base over the years. However, about a year ago they decided to put their artistic efforts into creating a full length kids album under the moniker of OzoKidz. 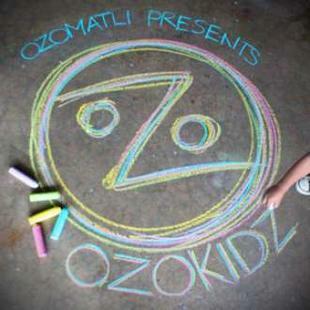 Ozokidz still contains the signature cacophony of sound that is part of what makes Ozomatli so thrilling to listen to. You can’t help but be drawn into a dance-induced stupor while moving your body to the hypnotic sounds produced by the 7-piece band. The careful construction and work put into the album is impressive. Many of the songs contain lyrics aimed at educating kids and prompting intellectual conversations about things like photosynthesis, germs, spelling and planets. It’s been such a pleasure enjoying music with my daughter by a band I have been a fan of for many years. It’s pretty wacky that a band I used to listen to in my “youth” is now making music for an even younger generation. This is a beautiful thing, sure to benefit kids for years to come. Listening to OzoKidz is like listening to a non-stop musical party. I am pleased to present a conversation I had with Raul Pacheco (Electric guitar, Tres, Jarana, Lead vocals, Background vocals) about the record. See below for details on where to pre-order your copy of OzoKidz, a sample clip and download for “Balloon Fest” and some information on getting a super special OzoKidz chalk box! KCG: On the OzoKidz album what song(s) is your voice most prominent on? KCG: Were you guys thinking of targeting a specific age range for OzoKidz? Raul: I think…under 10. I mean, I think we were really thinking something meaningful like that. Appealing to bodies that are not afraid to act silly, kinda vibe. KCG: Older kids are probably either listening to Ozomatli or influenced by peers or songs on the radio. KCG: I was watching the Summit 11 video that you guys did and some questions relating to OzoKidz popped up for me. You guys have always had an active voice in politics. With regard to OzoKidz, it’s juvenile, very light-hearted and exciting. It seems to really appeal to kids in your targeted age range. Have you thought about supporting causes for kids as OzoKidz? Raul: Definitely. We have before and we’ll probably continue to do that. Regardless of this CD I mean we’re always doin’ stuff for young people. We support alot of music in our programs in Los Angeles and also in other parts of the country. KCG: What about things like bullying or guns? Now that you’re doing kids’ albums, is there something that you would think about in terms of representing through song, with regard to bullying or guns or acceptance in terms of cultural or ethnic diversity? Ra: I think we’d be all for it. When making this music, we weren’t specifically thinking about what causes we would get into. I think we were thinking about making kids music. I think we have a reputation of supporting kind of proactive organizations, highlighting issues that are important to us. I don’t think that would change and I think that this does offer another opportunity for that. But, we haven’t done anything specifically in regards to this CD. KCG: In your opinion, what is kids music? Raul: I think it’s music that has kind of a more innocent, lighter, celebratory tone. That’s not every kids life, but I think with the music we were trying to make, it was really about introduction to some ideas that we talk about in the songs. Some ideas of nature, some ideas of conservation, some ideas of health. And some of it’s also just things that resonate with young people. Certain things they can be involved in or like. So when you say what is kids music, to us I think it’s a sound. There’s a traditional kids’ market — which we found out about as we were doing this. We wanted to make it a little more detailed. Essentially we just didn’t want it to be for kids. We wanted parents to enjoy it with their children. KCG: I think you accomplished that, definitely. KCG: How long did it take you guys to write the OzoKidz album once you realized it was an idea you’d like to pursue? Raul: I mean it took us a long time because we were doing it while we were doing other things. So, I think over a year. Around the period of the year…we would work on it alot for a few months, leave it alone and then we’d get back to it. I think it always takes a bit longer to make recordings because we’re always working. So yeah, it happened over a year. KCG: You guys have done work in an orphanage and for blind kids. During the time that you have done things abroad in the presence of children, had it occurred to you to do something like OzoKidz? Raul: No, I think it was just an idea that came out of our own, ya know, the passing of time. We’ve been around for 18 years so we ourselves have children and alot of our fans have children. And it kept coming up for people. So it was like “oh well would we even venture to do this?” I think when the idea first came up, people weren’t necessarily into it. But as we thought about it a little bit more people thought is this something that we can pull off and have it be cool and not have it be corny, and could we separate OzoKidz as its own entity away from Ozomatli enough so they don’t overlap. We don’t want them overlapping. We really want a distinct experience with the music and the shows. They’re very different in what they’re geared toward. Once we got over the idea that just because it was a little different or whatever fears we might of had about it being corny, or whatever, we were able to dig in and really make a solid kids album. Like if we were going to do it, let’s make a really good one and we feel pretty proud about it, actually. KCG: You guys did a really nice job with it. You stayed true to the Ozomatli sound. But then listening to the words I was struck by how detailed you get in the songs. You actually drop some science in some of the songs. KCG: Clearly you thought out some of the songs like Germs and Trees and even Sun and Moon. The Tree Song is definitely like wow, you know you go from the seed and even mention photosynthesis. That to me was a nice surprise. And then there’s “Germs” which my daughter seems to be really concerned about these days, especially when it comes to brushing her teeth. Let’s start with “Germs” in particular. You guys go through germs in your body, you go through bacteria in medicine, and you really get deep into the details of it all. How did that come about? Did you do research? Raul: What was really helpful in that is that we had done these kid songs for PBS Kids first. And they were super adamant about the lyrics. We had to keep it simple but creative, informative. I mean they’re really coming from an educational perspective. And these guys have been doing it for years. It’s their careers, they make kids media for PBS. And PBS has to have a little bit more of an educational purpose in it. So, from that experience we really took that and put that into some of these songs. Like, how to really make a list of things and really put them in a way that was clever but not too petty; enough information where you’re being challenged but not too much information where you’re just overwhelmed. So I think with a few of those we did a pretty good job of really having that balance so that anybody listening to the song can have some kind of relationship to it. If it’s the kid, if it’s their parent. It could be a conversation piece. And musically, they’re all different styles and so there could even be a conversation piece about that. But I think it’s like getting young people to have discussions about it and young people with older people, ya know, who are their teachers or who are their parents can kind of be able to have this shared experience on this music and on these subjects. So I think this experience before of writing songs for PBS in hindsight, was really helpful. KCG: Typically with Ozomatli there is alot of Spanish. With the OzoKidz album there is some Spanish weaved into certain songs and then there’s Changito. Did you think about balancing Spanish and English for this album? Raul: Yeah we did, we thought about it. There were some Spanish songs that didn’t make it in the final cut, because I just think that those songs weren’t as good. And I don’t think it has anything to do with the language. It’s just those particular songs were not as well rounded and they just weren’t as good songs. For me, I wish there were more but it’s not the way it came out and, at some point, we just let it go. KCG: How many people contributed to the writing process on this album? Raul: Ya know, I think it’s the same way for all of us. Some songs are all of us, some songs are just a few of us. It’s never really like either or. Sometimes it might be one person really spearheading it. Sometimes it’s everyone taking a piece and contributing. It really varies. KCG: Does the music come first and then the words? Is there a method to the writing? Raul: There’s no method. I prefer that. There’s no method. Just whatever comes out. We start to gravitate towards what moves everybody. KCG: Do you have a personal favorite on the album? KCG: But it’s so authentic. Kids are pretty honest and you can tell right away if they’re getting into it. Raul: You have to be better at reading. Cause they get bored quick. When you perform, it’s like you have to be really engaged with them. Our shows are not more than 40 minutes long. But overall the shows are alot of fun. KCG: I can tell you that my daughter loves Moose on the Loose. When we got the album, she was dancing so hard that I think we only got as far as “Exercise” before she had to stop dancing because she was sweating and exhausted. There is just no other way to enjoy OzoKidz. When you put the album on, it’s nothing but a party. You’re just gonna dance and move your body and get into it. KCG: Were you influenced by other kindie bands or had you done any research into what other kids’ musicians were doing? Raul: I think we did it more like finding out if this was even viable for us to do. And then our manager researched it and said “yeah, there was a whole bunch of people doing this.” And we heard some music just to kinda get an idea and then I think part of our own competitiveness was like “Oh we could do this, we could do a good job at this, actually.” When you’re around for as long as we are, we try to do some things that we’ve never done before. And this was alot of fun. I think one of the things is that there wasn’t as much pressure we would put on ourselves as we would with an adult Ozomatli record. So I think there is something that we definitely walked away with from this process that we’ll be bringing back into our own music. KCG: Did you learn something about yourself that you hadn’t felt or noticed making adult records that you could take back to your work as Ozomatli? Raul: I think that sometimes we have a constricted view of what we can be as a band. Part of that is practical because you don’t want to alienate the fans you already have. It’s like a business. Part of it is constricting though, also. My particular idea is that I always wanna do stuff different. I don’t particularly want to be bound by our history. But, you know, you are on certain levels. You know people expect something from you. And when you don’t do that, it’s like “oh they’re not the same band.” Well, I aways try to remind people we’ve never been the same band. Like whatever vision you have of us in your head, is really your own. Our first record is very different from the next one, which is very different from the next one, which is very different from the next ones, and so on and so on. We’re all the same people playing on them. I find my own artistic life more interesting to push those boundaries as much as possible. I mean we’re writing music now for an adult record which sounds very different from the ones we’ve done before, and it scares some people and some people really like it. So, who knows what it will be in the end. But, I as a musician, I prefer that. I prefer kinda going through these places that are different for us. And I think the kids record was actually that also. There were some of us that just didn’t wanna do this and it’s like “Why what is this about?” and they sit around and talk about it and you know, you kinda have discussions, then all of a sudden the group seemed to be open to it and then that’s cool. So it’s just another shift; it’s something new. And I think once you commit to doing it, there’s already good value. So overall, like I said, I’ve been really happy with it and people seemed to really like it, which ultimately is what is important. KCG: Are there still more OzoKidz songs out there that didn’t make it to this album? Raul: Yeah! Yeah, there are! You know when we write, we write a bunch of songs — and so I have a feeling we are going to do another one, I just don’t know when. But, I’m sure there’s gonna be some more songs coming out. KCG: Do you think that you’ll play some of those at live shows? Raul: We really separate these songs from our adult stuff. All the songs on that are on the CD we’ll play at the OzoKidz show, but you won’t hear some of those songs at one of our adult shows. That could always change, but that’s the way it is right now. KCG: Did you test out OzoKidz on any kids before releasing it? Like your own kids, for example. Raul: No. I mean there are some songs that we played at kids shows before the CD came out but no we just kinda went for it. KCG: Do you happen to have a message to kids listening to this CD or anything that you want to say to your audience or their parents? Raul: It’s really for the kids. Ya know, it’s just really for the kids. And I would say to turn it up really loud and dance all around your house. KCG: And that’s what I would say as well. KCG: “Sun and Moon” reminds me of a Yo Gabba Gabba song. Have you considered appearing on Yo Gabba Gabba or have you been asked to work with them? Raul: We’ve played their live shows in California. We’ve been Super Music Friends on their live shows, which are huge, it’s crazy. KCG: So, on a more personal level. Are you still dancing to the Jackson 5? Raul: Oh yeah. I used to get money from the neighbors to show up at parties and then get down. I’d walk out with 5 bucks in quarters and then take it to the store. KCG: Do you still do that? Raul: Not for money. But I’d still do it. I heard Jackson 5 the other day. It was rockin’. KCG: Jackson 5 is classic. KCG: Well, Raul, thank you for your time. It’s been a pleasure and we look forward to the official release. 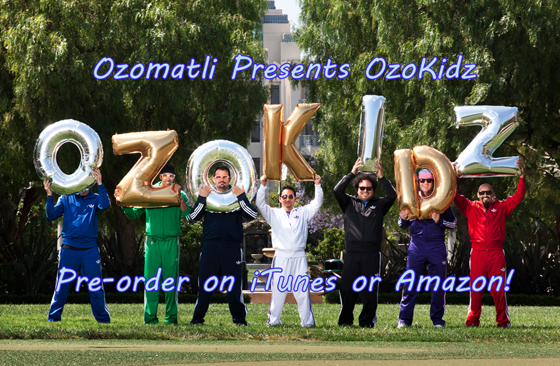 OzoKidz is currently available for pre-order on iTunes and Amazon and will be officially released on September 25. You can also listen to digital samples from Amazon. As a bonus, if you purchase the Ozokidz album at participating independent stores, you will receive a FREE Ozokidz chalk box that includes a link to the bonus track, “Vamos A Cantar.” What’s more exciting is that you’ll be able to participate in the Ozokidz Chalk art contests. All you have to do is recreate the Ozokidz album cover art on your driveway or sidewalk. For the bonus prize, you can create a visual representation of the bonus track “Vamos A Cantar,” using the Ozokidz chalk, send in photos of your artwork and they’ll pick the best ones. Winners will receive an Ozokidz prize pack! Send photos to ozofans@gmail.com. When sending photos, please include the Ozokidz chalk box in the photo. For a list of participating independent stores click here. You can enjoy a sample download from the album called “Balloon Fest” below.